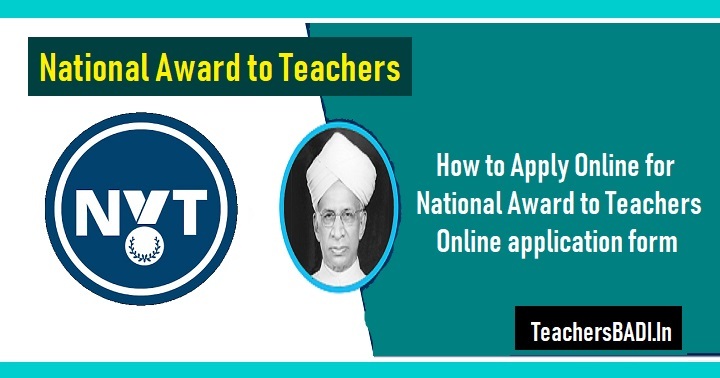 How to Apply for National Award to Teachers 2018 Online application form (Apply Online) at http://www.nationalawardtoteachers.com/, Step by Step Procedure to apply online: MHRD has given the National Award to Teachers, 2017 notification for Selection of Best Teachers for National Awards and receiving Proposals in the prescribed Online Application Form for selection of teachers for National Awards for the year 2017. Govt.of India, Ministry of Human Resource Development, New Delhi implements the "National Awards to Teachers"scheme every year and requested to all the teachers in India to submit the Online application forms for selection of Teachers for National Awards for the year 2017. A Web portal and a Mobile app have been developed for applicants to complete self. 1. OPENING OF WEB-PORTAL FOR INVITING APPLICATIONS - 15TH JUNE TO 15TH JULY, 2018. 4. Letters/communication to be issued by MHRD through online portal to all the shortlisted candidates by 3rd August. 5. Finalization of names by Independent National Jury by 30th August, 2018.